Whether you just grab a piece of toast to eat on the way to college or you prefer to take your time and sit down to a proper meal first thing in the morning, there are plenty of ideas for both quick and leisurely breakfasts here. Breakfast is an important meal. The name does literally mean to break a fast - referring to the fact that you haven't eaten for a good ten hours or more and, as such, your body needs some fuel to kick-start it for the day ahead. Many people seem to skip it altogether but this isn't a good idea and will only lead to crazy cravings during the morning or an embarrassing rumbling stomach during lectures. 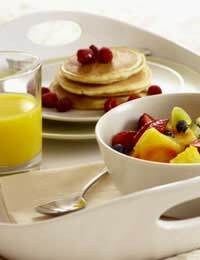 If you really don't have time for anything more than a quick snack on the go, that's better than nothing but it's well worth getting up just a few minutes earlier and having a proper breakfast - your body will thank you for it. A good breakfast should supply your body with some lovely slow-release carbohydrates that will keep you going until lunchtime, providing you with plenty of energy to embrace the busy day ahead and give your brain the fuel it needs to concentrate. Many nutritionists would say that a bowl of porridge is the ideal start to the day as it ticks all the right boxes. While you may have less than salubrious memories of being 'encouraged' to eat lumpy porridge on cold, winter mornings, you should push those thoughts to one side and give it a go. You can prepare it with either milk or water, or a mixture of both and choose good-quality porridge oats for a really wholesome, creamy taste. If you can't bear the thought of getting up early, you can prepare it the night before. Just bring the oats and milk/water to a simmer on the hob, then remove from the heat, cover the pan and leave. Just reheat it quickly in the morning and breakfast is served. Add some chopped banana or strawberries for extra flavour. A good source of protein, eggs will really set you up for the day and they don't take long to prepare. Try boiled, poached or scrambled and serve with wholemeal or granary bread for a healthy boost. This is another filling option. You can easily make your own using oats, bran and a selection of dried fruit and nuts. This means you know exactly what's in it and you can pick and choose the ingredients. Why not make a real meal of it by adding some natural yogurt, chopped fruit and honey? White bread is more processed than brown so try and steer clear of it if you can. The best option is granary as it contains whole grains, which release energy at a more controlled pace. There's nothing wrong with a couple of slices of toast and a mug of tea for breakfast but you might find yourself getting peckish again halfway through the morning. Bagels, pancakes and muffins are other bread-based breakfast options that you might like to try for a change. For a more substantial meal, go European and top your bread with some salami and cheese. These are just a few ideas to get you started. There's nothing complicated here but it's nice to alternate your breakfast menu and start seeing it as a proper meal and not just an essential pit stop on the way out of the door in the morning.